FAST-food giant KFC has sparked outrage from health experts by offering Christmas gift cards worth up to $500 as the nation battles an obesity crisis. 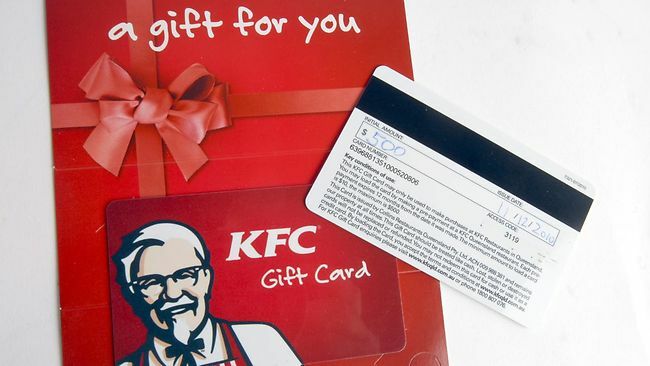 KFC outlets have been promoting the cards, ranging in value from $10 to $500 and to be used within 12 months, as a "thoughtful gift idea for any occasion''. A $500 card could purchase a fat banquet of 14 buckets of "Original Recipe'' chicken pieces, containing 4.5kg of fat and 1.8kg of saturated fat; 63 maxi serves of "Popcorn Chicken'' (2.8kg of fat and 1.25kg saturated fat) or 78 "Original Works Burgers'' (1.6kg fat, 592g saturated fat). The "tasty new gift idea'' has attracted outrage and disbelief from health experts in Queensland struggling to combat a growing obesity epidemic. About 55 per cent of adult Queenslanders, and about a quarter of children aged five to 17, are considered obese or overweight. An average of 60 people are diagnosed with type 2 diabetes every day around the state. Preventative Health Taskforce chair Professor Rob Moodie said he was shocked when he learned about KFC's latest marketing ploy. Prof Moodie said aggressive fast-food marketing was the last thing parents needed as they struggled to teach children proper eating habits. Brisbane-based nutritionist and dietitian Trudy Williams said the gift cards were "worrying''. Ms Williams, who wrote the award-winning nutrition guide This=That Child Size, said parents should think twice about fast-food Christmas treats. Diabetes Australia Queensland CEO Michelle Trute said gift cards made poor eating choices easy. Very interesting point of view. Again and again I appreciate your way of putting things.